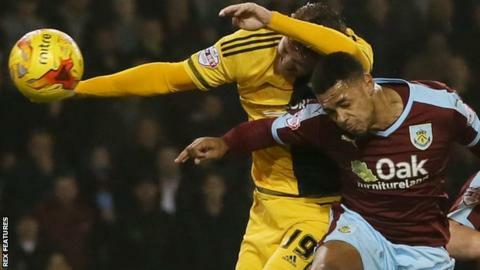 Andre Gray scored twice for a third successive home game as Burnley recorded their fifth win in six games with victory over Fulham. Gray's powerful header from David Jones' cross gave the hosts a deserved lead and he then fired in from Scott Arfield's clever pass. The Cottagers got back in the game at the start of the second half when Ross McCormack curled past Tom Heaton. Fulham pressed but Matty Taylor's late strike moved Burnley up to second. Sean Dyche's side have now won five of their past six games in the Championship and have made an impressive start to the season following their relegation from the Premier League. They opened the scoring when they worked a short corner to Jones, whose whipped cross found Gray at the back post to head home. His ninth goal of the season arrived following a clever run and finished from Arfield's incisive through ball. Just after the break, McCormack netted his 10th goal of the campaign, finishing superbly with his left foot after being laid in by Tom Cairney. The Clarets continued to attack and Gray hit the crossbar before Wales international Sam Vokes had a header cleared off the line. Fulham pressed for an equaliser in the closing stages, with McCormack shooting straight at Heaton and Moussa Dembele volleying over. Substitute Taylor secured the win for Burnley when he struck in injury time, firing into the bottom corner from just inside the box. "We know there's no guarantees - you have to be ready every single time and you have to find different ways of operating, different ways of winning. "I haven't played a Championship game yet that is a walk in the park, that's for sure. "Sometimes you are performing like tonight in the first half, and it was a more comfortable performance. The second half it wasn't. You've got to be right all of the time." "You lose games of football sometimes, but if you are going to go down then go down with your boots on, having a right go. "We did that in the second half so I have no complaints with the second half. "I thought we were very brave, really had a go and if we had got something out of the game then I don't think too many people could have complained." Match ends, Burnley 3, Fulham 1. Second Half ends, Burnley 3, Fulham 1. Attempt missed. Richard Stearman (Fulham) header from the centre of the box misses to the left. Assisted by Ross McCormack with a cross following a corner. Goal! Burnley 3, Fulham 1. Matthew Taylor (Burnley) left footed shot from the centre of the box to the bottom left corner. Assisted by Scott Arfield. Attempt blocked. Moussa Dembele (Fulham) right footed shot from outside the box is blocked. Attempt saved. Moussa Dembele (Fulham) left footed shot from the left side of the box is saved in the centre of the goal. Assisted by Alexander Kacaniklic. Corner, Fulham. Conceded by David Jones. Corner, Fulham. Conceded by Matthew Taylor. Attempt blocked. Ryan Tunnicliffe (Fulham) right footed shot from outside the box is blocked. Corner, Fulham. Conceded by Michael Keane. Attempt blocked. Matt Smith (Fulham) left footed shot from outside the box is blocked. Substitution, Fulham. Lasse Vigen Christensen replaces Ryan Fredericks because of an injury. Attempt blocked. Ross McCormack (Fulham) left footed shot from the centre of the box is blocked. Assisted by Ryan Fredericks. Attempt saved. Moussa Dembele (Fulham) header from the centre of the box is saved in the bottom left corner. Assisted by Ryan Tunnicliffe with a cross. Corner, Fulham. Conceded by Tendayi Darikwa. Attempt missed. Moussa Dembele (Fulham) right footed shot from the centre of the box is too high. Assisted by Tom Cairney with a cross following a corner. Attempt blocked. Andre Gray (Burnley) right footed shot from outside the box is blocked. Assisted by David Jones with a cross. Corner, Burnley. Conceded by James Husband. Attempt saved. Ross McCormack (Fulham) right footed shot from outside the box is saved in the bottom right corner. Substitution, Fulham. Alexander Kacaniklic replaces Tim Ream. Offside, Burnley. David Jones tries a through ball, but Ben Mee is caught offside. Attempt missed. Andre Gray (Burnley) right footed shot from the centre of the box is too high. Attempt blocked. Sam Vokes (Burnley) header from the centre of the box is blocked. Assisted by Tendayi Darikwa with a cross.